James Earl Carter Jr. was born October 1, 1924 in Plains, Georgia. His mother Lillian was a nurse and his father Earl was a farmer and owned a farm products store. Their home had no electricity until 1938, no indoor plumbing, and had a windmill and well outside where they could get water. His mother said he was always lucky. When he was four years old he pulled out the drawers of a chest and tried to climb up on it. He pulled it over and shattered the mirror, but was unhurt. When he misbehaved as a child, his mother would punish him before his father got home to save him from a somewhat stricter punishment from his father. When he was growing up, Jimmy and his siblings got up at 4 A.M. with the rest of the family to do their chores. He and his father plowed the field with mules. After working in the field he would go back to the house and draw water, care for the mules, and chop wood. They also raised chickens and he helped to catch and slaughter chickens for their meals. Sometimes they got a reprieve* from the chores. The children learned if they were reading, they didn't have to do the work. They became avid readers. There were no antibiotics when Jimmy was growing up. The treatment consisted of aspirin, castor oil, iodine, and patent medicine. * One deterrent called for a vile smelling potion worn in a belt around the waist. No doubt it kept sick people away from them. He was an entrepreneur* from an early age. When he was six years old he had a business pulling up peanuts which they grew on the farm. His mother helped him boil them, and he bagged them and sold them in town. The venture profited him about $10 a week. When he was nine years old he bought five bales of cotton which in later years he sold for a profit. With that money he bought five houses which he rented out and later sold. Their house was on the main highway and many people out of work came by and asked for food or drink. None were turned away, and some offered to do some chores in return. The family later learned that symbols had been scratched on their mailbox post indicating they were a kind family who was willing to help others. The Carters always planted a large field of sweet potatoes and let neighbors come and harvest them for free. Jimmy's mother Lillian was a nurse. When she was working 20 hour shifts the children were cared for by one of the black women who lived nearby. He attended a very small school in Plains where all the different grades were in one building. He made good marks in school and finished first in his class when he was a senior. His father was determined Jimmy would graduate from college. No one of the Carter ancestors had ever finished high school. From the time he was five years old he dreamed of being in the navy and upon graduation from high school, he attended Georgia Southwestern College. Next he went to Georgia Institute of Technology where he joined the Navy Reserve Officer Training Corp (ROTC). When he was 19 he received his congressional appointment to Annapolis, the naval academy. After graduating from the academy he married Rosalynn Smith, a girl from his hometown. He was 22 and she was 19. After he was commissioned in the U.S. Navy he served on battleships and spent long weeks away from Rosalynn. Jimmy's Uncle Tom had a big influence on his political career. Uncle Tom, who was his hero, sometimes chided* Jimmy when he was in the navy because Tom outranked him by two grades. Unfortunately, Tom didn't live long enough to see his nephew become commander-in-chief of the armed forces. His father Earl Carter was a member of the Georgia state legislature when he became ill with pancreatic cancer. When his father died, Jimmy resigned from the navy and returned to Plains to manage the farm and agricultural store in Plains. Rosalynn was horrified. When they earned less than $300 the next year (1954) it certainly looked like he had made a mistake. But better times were ahead and the business flourished. Several years later his brother Billy returned to become a partner in their agricultural supply business. During the 1950's there was much racial discrimination in the south, but the Carters fought against discrimination against blacks even though it was unpopular and hurt their business. Jimmy even resigned as a deacon in the church where they were members when the church leaders banned blacks from the worship services. In 1962 he ran for a senatorial seat and won after insisting on a recount of the votes. It seems the opposition had stuffed the ballot box with votes from dead people and people in prison. He served two consecutive* two-year terms, then decided to run for governor, but he lost the election to Lester Maddox. At this time he faced a spiritual crisis in his life, but became a born again Christian encouraging others in their faith. He also determined he would run again for governor and this time he would win. In 1971 he was inaugurated as Georgia's 76th governor. He shocked many of those who had helped him to be elected by declaring in his speech that the "time for racial discrimination is over". He made good on his word by creating opportunities for blacks and appointing them to boards. He passed laws adding land to the public parks system and worked to preserve the rivers in the state. He felt he could also serve in an even greater capacity and in 1975 announced his candidacy for the 1976 presidential race. He surprised a lot of people, even his mother. When she heard he was running for president, she asked, "President of what?". He read and studied and became well informed about all aspects of the government and foreign affairs. He was determined he would win. His friends and family were not so sure. Richard Nixon was president and when the scandal over the cover-up of the break in at the Watergate building occurred. Nixon resigned in disgrace and Gerald Ford took his place. This upheaval gave Carter a better chance of being elected. And he was elected on November 2, 1976. Jimmy Carter would prove to be an unconventional president. He insisted on being called by his nickname "Jimmy". When he was inaugurated, he and his family walked down Pennsylvania Avenue instead of riding in the bulletproof limousine. He sold the presidential yacht, reduced the White House staff, and asked that they not play "Hail to the Chief" when he entered the room. Their daughter Amy attended public schools in Washington. It was different, indeed. He pardoned the Vietnam era draft dodgers and called for a halt to the production of the B1 bombers. Instead, he promoted the development of the cruise missles which could be launched from submarines and airplanes. He passed into legislation the Alaska Lands Bill which set aside 104 million acres, which tripled the country's wilderness area, but he was unsuccessful in getting a national health insurance program or welfare reform. By 1978 the people had lost confidence in the president to solve the problems facing the nation. There was a shortage of fuel. Gasoline had gone from 40 cents a gallon to 70 cents a gallon and there were long lines of cars waiting to get the gas that was available. By 1980 his approval rating was at 21%, the lowest rating on record for any president. Also during this period Iran captured 52 Americans and held them hostage for 444 days. They would not be released during Carter's administration, but just minutes after his term ended and Ronald Reagan assumed the office of President, the hostages were set free. One significant accomplishment of his administration was the Panama Canal Treaty in 1978. The United States had controlled the canal since it was built in the early 1900's. The treaty called for the gradual transfer of the canal to Panama by December 31, 1999, and another treaty stated the canal would always remain neutral in times of peace and war. When it came time to ratify the treaties they passed the Senate by only one vote. 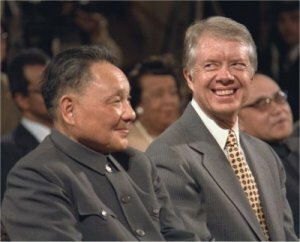 Another important event in Carter's administration was his full diplomatic recognition of the People's Republic of China, which was a Communist country. The nationalist government backed by the United States had been driven from the mainland to the island of Taiwan. President Nixon had first made a visit to China in 1972, but Carter was responsible for establishing a dialogue* with the regime* and creating an arts exchange program. Diplomatic relations were normalized in January of 1979. Premier Deng Xiaoping (duhng shou-ping) visited the United States and spent three days with the Carters at the White House. The United States and the Soviet Union for 40 years had been locked in a conflict described as the "Cold War". There were two blocs of power, the Western and the Eastern. Both countries had huge arsenals of weapons. 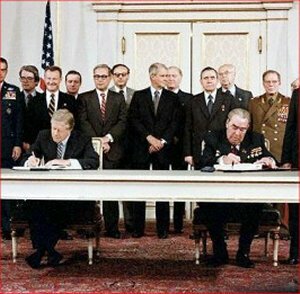 In 1969 the two countries began Strategic Arms Limitation Talks (SALT) and in 1972 both countries signed the SALT I treaty that restricted the use of nuclear weapons and banned the building of new nuclear weapons for five years. When Carter became president, the treaty had expired and he began working toward a new SALT II treaty with Soviet President Leonid Brezhnev (Lee-uh-nihd brezh-nev) in Vienna, Austria. After five years of negotiations they resolved the differences and signed the treaty, but the treaty was never ratified* by the Senate. The Soviets invaded Afghanistan and the United States began to apply pressure to the Soviet Union. In the following years through a series of other treaties, the two countries began to disarm. Carter's role in the Camp David Accord will probably be remembered as a diplomatic* high point of his administration. 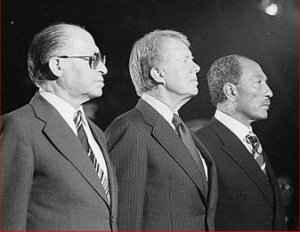 He brought together two old enemies, Anwar Sadat (AHN-war sah-DAHT), the president of Egypt and Menachem Begin (muh-nah-km BAY-gin), prime minister of Israel. Enmity between the two countries went back hundreds of years since Biblical times, and there had been violence between the countries for the past 30 years. In 1948 when Israel declared its independence, there was much anger and resentment by the Palestinians who already lived in the area. Several countries laid claim to the land and as more and more Jews moved to the area, the conflict escalated. Years of struggle have taken place over the occupancy of the area. President Carter invited both men and some of their staff to meet in the United States to try and resolve the differences. The meeting took place at Camp David, which is the official country place of the president. When discussions became too intense Carter had the men to occupy different cabins and he would shuttle back and forth between the two in an effort to reach a consensus. After 13 days of meetings an initial agreement was reached. After the men returned home and months later an official peace treaty was signed on March 26, 1979. 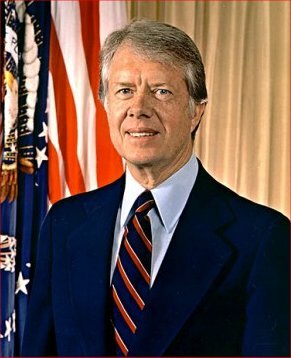 Of course, that was not the end of it and conflict remains until the present time, but Jimmy Carter received praise for the progress that was made at that time. 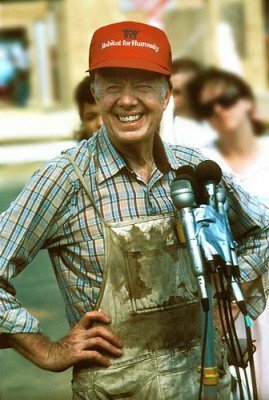 When Jimmy Carter's days as president were over, he entered another phase, possibly the most productive time of his life. After leaving office and moving back to Plains, Georgia he became active in support of human rights and helping people over the world resolve conflicts. He became a prolific writer and authored several memoirs and wrote books for children. Ten of his books have been on the Times best-seller list. In 1984 Jimmy and Rosalynn became involved with Habitat for Humanity, an organization which builds homes for low-income families. They spend a week every year with hammer and paint brush in hand helping to build homes throughout the country and also in other countries. The Carter's have four children, three sons, Jack, Chip, and Jeff, and one daughter Amy who was nine years old when her father became President of the United States. In 2002 he was awarded the Nobel Peace Prize "for his decades of untiring effort to find peaceful solutions to international conflicts, to advance democracy and human rights, and to promote economic and social development". This biography by Patsy Stevens, a retired teacher, was written July 10,2012. Press "Go" to search for books about Jimmy Carter. This page displayed 27,004 times.